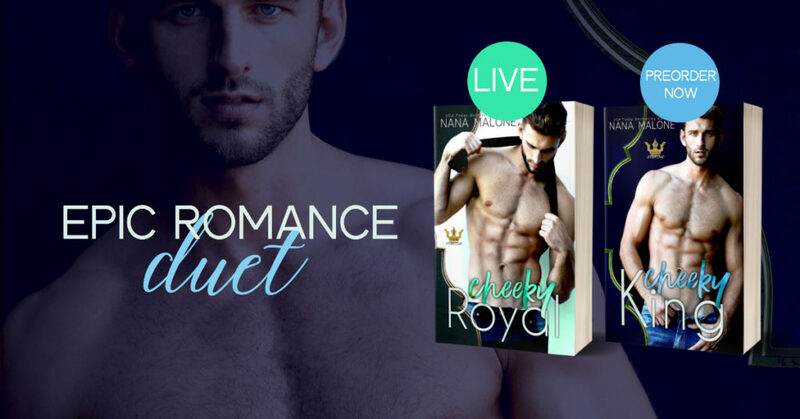 Excerpt + Pre-order: CHEEKY KING by Nana Malone | The Biblioholic ~ Read more. Sleep less. Keep reading for an excerpt and PREORDER Cheeky King Now! I shook my head. "No. This guy just didn't seem to understand my disinterest in him. And when I put my drink down, I accidentally kneed him in the balls." Sebastian’s eyebrows rose. "You accidentally kneed him in the balls?" The guy was still moaning on his knees. "Yeah, I didn’t mean to do it." I blinked my eyes as innocently as I could. Then the unthinkable happened. Sebastian's arm went around me, and his voice went low and deadly as he addressed the guy on the floor still howling and holding the family jewels. "Listen to me. She's a friend of mine. If I see you near her again, I’ll make your life very difficult. What she did to you on accident will seem like a walk in the park." When he pulled me closer, I tipped my head up to glance at him, eyes wide. I was unprepared for what happened next. Sebastian squeezed me tightly, and I could see the muscle in his jaw twitching. He leaned over and brushed his lips against mine. The kiss was electric, hot, and quick. And then it was over so soon I couldn’t be sure it had happened. His electric blue gaze bore into mine before he whispered, "Like I said. She's mine." He let go of me then, and I had to work hard to fight the feeling of emptiness. Yeah, that's right dumbass, you're not actually his.